The No. 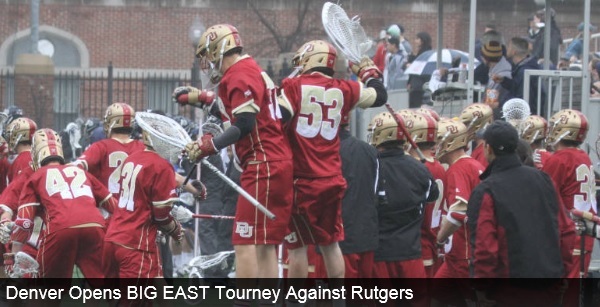 2/2/3 University of Denver men’s lacrosse team opens the BIG EAST Tournament as the No. 1 overall seed this Thursday against No. 4 seed Rutgers at Villanova Stadium in Villanova, Pa. The Pioneers and Scarlet Knights will open the tournament with a 2:30 p.m. MT face-off. Rutgers is 8-7 on the season and 3-3 in BIG EAST Play. Denver has won nine straight games, sitting at 12-2 on the season. The Pioneers are coming off a 17-9 win over Marquette at Peter Barton Lacrosse Stadium to capture the BIG EAST Regular Season Title. The win-streak is the Pioneers’ longest since the 2011 season in which Denver won 12 straight games before losing to eventual NCAA Champion Virginia in the NCAA Tournament Semifinals (05/28/11). •Denver and Rutgers are deadlocked at 1-1 in the all-time series that dates back to March of 1999. • Earlier this season, Denver defeated Rutgers 17-11 at home in front of a sold-out crowd of 2,232 fans. •The Scarlet Knights come into Thursday’s contest with an 8-7 overall record. •Although Rutgers has lost three of its last five, the Scarlet Knights stole a 12-8 win over Georgetown over the weekend to seal its trip to the BIG EAST Tournament. •Scott Klimchak leads the Scarlet Knights with 42 points off 37 goals and five assists, while Christian Trasolini is close behind with 40 points off 27 goals and 13 assists. •Face-off specialist Joseph Nardella has won 199-of-306 face-offs for a 0.650 winning percentage, ranking him No. 4 in the nation. •Goalie Kris Alleyne leads the team with 116 saves, while also posting a .504 save percentage and an 11.03 goals-against average. •Rutgers averages 12.47 goals, 7.6 assists and 20.1 points per game off 38.8 shots per game. •Denver is coming off a 17-9 win over Marquette at home that improved the Pioneers to 12-2 overall, 6-0 in league play. •The Pioneers’ 12-2 start matches the best start for the program since 2011 when it advanced to the Semifinals of the NCAA Tournament. •Sophomore Jack Bobzien leads the Pioneers with 51 points and 34 goals, while also dishing our 17 assists. The transfer ranks No. 25 in the nation in points per game (3.64) and No. 27 in points per game (2.43). •Bobzien and junior Carson Cannon picked up BIG EAST Honor Roll honors after their performances in the Pioneers 17-9 win over Marquette. Bobzien tallied five points off four goals and one assist, while Cannon caused three turnovers and picked up two ground balls. •Junior Wesley Berg is second on the team with 48 points off 33 goals and 15 assists. •Senior Jeremy Noble leads the Pioneers with 27 assists and has 38 ground balls on the year. •Face-off specialist Chris Hampton has a team-best 42 ground balls and has won 95-of-195 face-offs so far this year. •Goalie tandem of Ryan LaPlante and Jamie Faus have been splitting time in net. LaPlante has 82 saves on the season, a .577 save percentage and an 8.90 goals-against average. Faus has 68 saves, a .540 save percentage and an 8.20 goals-against average. •Denver has the second-best winning percentage in the nation (0.857), the fourth-best scoring offense (13.36), the second best shot percentage (0.384) and the fifth-best scoring margin (4.71). Led by a career-high six goals from junior Erik Adamson (Anaheim Hills, Calif.), the No. 11/12 University of Denver men’s lacrosse team defeated the No. 6/8 University of Notre Dame 10-7 on Saturday afternoon in front of 5,870 fans at LeBard Stadium at Orange Coast College in the Pacific Coast Shootout. Adamson took eight shots on goal, scoring six goals, while also grabbing one ground ball. Freshman Zach Miller (Steamburg, N.Y.) finished with two goals and an assist for three points, while junior Wesley Berg (Coquitlam, B.C.) scored one goal and finished with two assists for three points. Berg also tallied a game-high three ground balls. Sophomore transfer Jack Bobzien (Littleton, Colo.) finished with one goal and one assist for two points, junior Sean Cannizzaro (Cazenovia, N.Y.) finished with two assists and senior Jeremy Noble (Orangeville, Ontario) tallied one assist and a caused turnover. Junior goalie Ryan LaPlante (Fort Collins, Colo.) made 10 saves and allowed four goals, while senior goalie Jamie Faus (Lakeville, Conn.) made seven saves and allowed only three goals. John Scioscia scored three goals for the Fighting Irish, while four others added goals each. Goalie Shane Doss made eight saves on the day. Notre Dame held the advantage in shots (46-29), ground balls (36-20) and face-off wins (15-of-21 to 6-of-21). 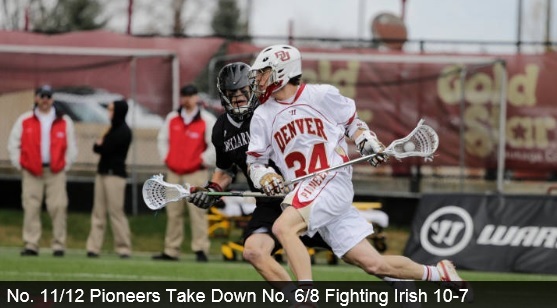 Denver capitalized on its lone man-up opportunity, while the Fighting Irish scored on three of its five chances. Denver also held the advantage in saves, 17-to-8. Denver jumped out to a 2-0 lead off goals by Adamson and Bobzien before Notre Dame’s Westy Hopkins scored with 5:21 left in the first. The Pioneers added another with eight seconds left in the quarter as Adamson scored his season of the game, 10th of the season to put DU up 3-1. 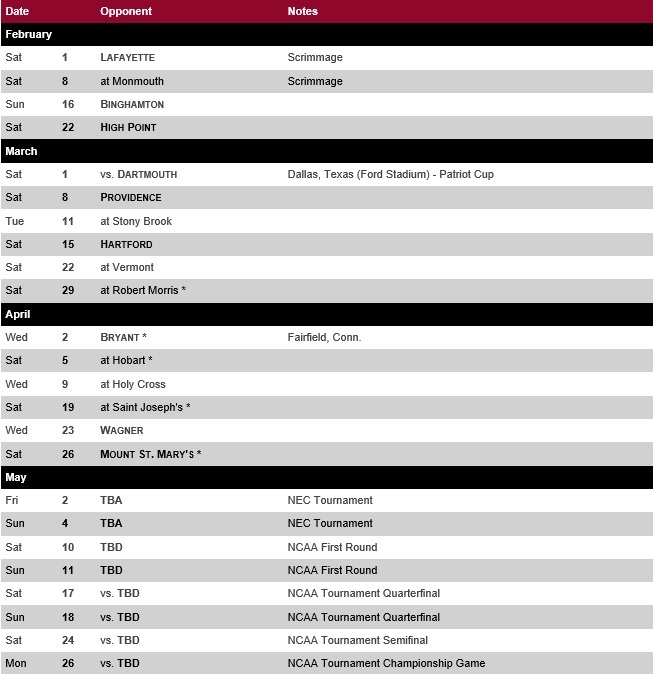 Sacred Heart men’s lacrosse head coach Jon Basti released the 2014 schedule on Monday. The Pioneers will play seven home games at Campus Field this upcoming spring, beginning on Sunday, Feb. 16 against Binghamton. The Chesapeake Bayhawks and the Denver Outlaws have executed a trade that will send the 2012 League MVP Brendan Mundorf to Annapolis in exchange for John Grant Jr., Michael Simon and the Bayhawks Second Round natural selection (No. 16) in the 2014 MLL Collegiate Draft. 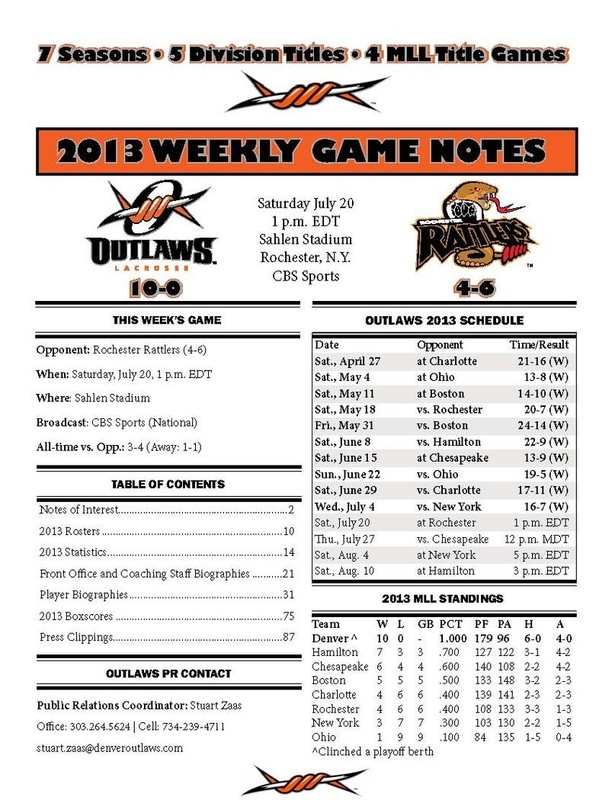 Selected 21st overall out of UMBC in the 2006 Collegiate Draft, Mundorf spent his whole career in an Outlaws uniform. In 90 games played he recorded 229 goals and 118 assists. He has been a consistent leader in the attack for Denver scoring no less than 20 goals per season. One of the last MLL originals to still play the game, Grant Jr. has been a polarizing figure in Lacrosse and the League since its inception. He scored the very first goal in the Summer Showcase in 2000 at Crew Stadium in Columbus, Ohio and proceeded to be named MLL Offensive Player of the Year in the League’s inaugural season while with the Rochester Rattlers. He can be found in the top five of many All-Time Career records including points, goals and assists. Throughout his career he helped three teams win the Steinfeld Trophy, in 2008 with the Rattlers, the following year with the Toronto Nationals and this season with the Bayhawks. When Adam Sargent arrived at the University of Notre Dame in the fall of 1993 from Brighton High School in Rochester, N.Y., he envisioned not only working with his teammates to achieve success on the lacrosse field but also looking forward to the day when he received his diploma in the shadows of the Golden Dome. He could not have foreseen how this education would prepare him for the challenges ahead. Sargent’s life was changed forever 13 years ago. At 8:30 on the morning of May 29, 1997, the 21-year-old senior, who had distinguished himself on a team that qualified for three straight appearances in the NCAA lacrosse tournament, was on his way to nearby Saint Mary’s College to take an exam when he was involved in a two-car accident at the intersection of Notre Dame Avenue and Angela Boulevard. The accident separated Sargent’s neck at the C-7 vertebrae and left him paralyzed from the chest down with somewhat limited use of his arms. Sargent’s focus soon changed from winning games to learning how to live again. 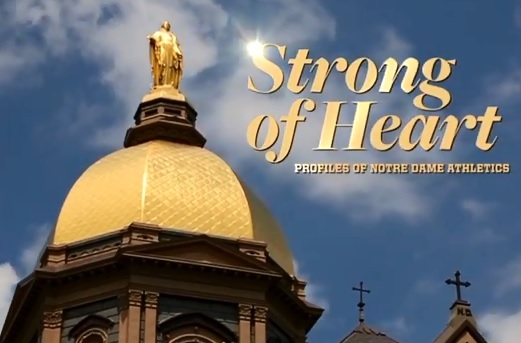 He not only graduated from Notre Dame with a double major in history and anthropology in 1999, but also matriculated to become a valued member of the University’s Academic Services for Student-Athletes, counseling members of the football, ice hockey and women’s golf teams. Major League Lacrosse (MLL), the premier professional outdoor lacrosse league, announced today a comprehensive content and partnership agreement with The Whistle, the first sports entertainment network focused exclusively on entertaining young fans and athletes with engaging and appropriate content. “MLL is an exciting addition to our team of major league partners and investors. As the fastest growing participation sport in the U.S. among today’s youth, there is a clear demand for lacrosse content from our audience and it makes a perfect fit to align with the top league. Our partnership will bring the best of on-field action, informative instruction content and key features from MLL’s top stars ,” said Jeff Urban, The Whistle’s co-founder and Chief Marketing Officer. The partnership gives The Whistle viewers access to game highlights, behind-the-scenes footage, how-to-tutorials, interviews with MLL stars, and a variety of opportunities to engage directly with their favorite MLL teams and athletes. The league will also give the network full access to its library of existing content to repurpose for younger viewers. Major League Lacrosse joins The Whistle’s partners, the National Football League, the PGA Tour, US Soccer, the Harlem Globetrotters, IndyCar and Alli Sports. The network delivers a mix of professional, amateur and user-generated content across the multiple media platforms younger fans use each day with the goal of keeping them more engaged, informed and active. “Increased interest and engagement by young fans is the backbone of MLL and will continue to drive tremendous growth for our sport and our league. The Whistle understands this audience and is entertaining, engaging and connecting with them directly across multiple platforms. Whenever young fans turn to The Whistle to learn more about sports, they’ll find out how exciting lacrosse is when played at the professional level,” Gross said.